2.1) One Nation. One Person. One Smart Card. 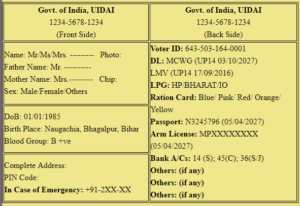 (UIDAI’s Individual Smart Card). All individual and group accounts (business, corporates) of various departments need to link with Aadhar card. (The process is already going on). Some of them are: Pan Card, Passport, Voter IDs, PF Account, LIC Account, Health Cards, Vehicles registered, Properties registered, Bank Accounts, University/Boards mark sheets, TIN, TAN, DIN etc etc. Grouping Family Members: Suppose there are seven people in a family. All Seven aadhar numbers need to be grouped under one family. One will be head of family (Senior member). Transferring member/s from one group to another or new group is possible (After marriage or after division of family etc). Pan Card: IT Dept. need to link all pan cards with Aadhar cards (This process is already going on). After linking all accounts, they can stop pan card campaign. There will be no word called pan card. New people no need to go for pan card. Aadhar registration is enough. Pervious alphanumeric pan card numbers (ex. BGABC1558C) will be replaced by 12 digit Aadhar card number (ex. 1234-5678-1234). IT dept. needs to change in their system. While filling IT returns, people will login to their account using user name (national portal user name) and password. Passport: If I am currently holding passport, I will link my passport and Aadhar card. I can use my current passport until I get UIDAI’s smart card. After some days (say after 2-3 months) I will get my smart card. After getting smart card, I will destroy my passport. In smart card I will not be having passport number, my Aadhar card number (i.e UIDAI’s smart card number) is my passport number. In my smart card, it will be printed as: Passport: YES. PF Account: Link all UANs with Aadhar card (This process is already going on). You need to change account numbers to Aadhar card numbers. New people will be given their Aadhar card numbers as UAN. Employees will login to PF account using user name (national portal user name) and password. Employers will login to PF account using user name (corporate portal user name) and password. Banks: KYC is already going on. DL: All DL holders need to link their DL with Aadhar Card. If I am currently holding any DL, then I will link both DL and Aadhar card. I will be issued (say after 3-4 months) UIDAI’s smart card. If I want to apply for DL, regular process needs to be followed. After all successful steps, DL authority will contact UIDAI. UIDAI will issue me smart card. LPG: All LPG Consumers need to link all their accounts with Aadhar cards (This process is already going on). LPG authorities no need to generate separate consumer number. Aadhar card number can be used as consumer number. Ration Card: FCSCP department need to link all their accounts with Aadhar cards (This process is already going on). They no need to generate separate consumer ID. Aadhar card number of head of family can be used as consumer number. Vehicles: RTO need to link all vehicles with its owner’s Aadhar cards. In case of company vehicles, it needs to be linked with Corporate Smart Card Account number. Properties: All properties needs to link with its owner’s (single or multiple) Aadhar cards. In case of corporate property, it needs to be linked with Corporate Smart Card Account number. Census Department: We will make compulsory for all people to go Aadhar Registration. Then it will ease the work of Census department. Universities/Boards: Aadhar number compusory on mark sheets / certificates. Future Implementation: Private Accounts: All private accounts (social medias, online shopping sites, digital wallets etc.) need to be linked with Aadhar cards. Other Organization: All relevant government and private organizations. Note: I being an individual, will link my Aadhar card with all departments. After linking I will login to national portal (read further topics), click on Generate Smart Card and mention my nearby Suvidha center name. After some days I will visit mentioned Suvidha center and get my smart card at free of cost. Suppose I got smart card and after some days I applied for DL. I completed all required steps related to DL. 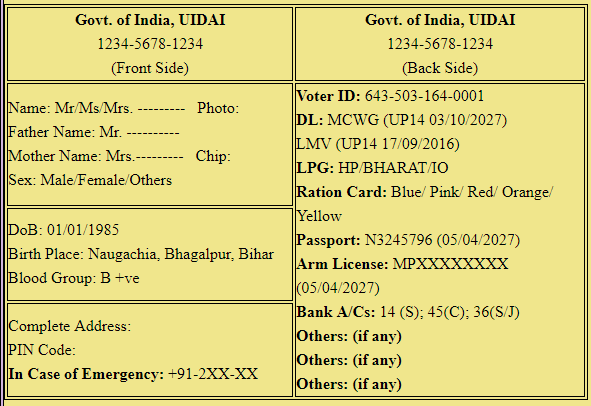 Then DL department will inform UIDAI that this particular person needs to be given DL (MCWG/LMV/etc). UIDAI will update my smart. I will login to national portal (read further topics), click on Generate Smart Card and mention my nearby Suvidha center name. After some days I will visit mentioned Suvidha center, submit my old smartcard, pay the fees and will get new one. Suvidha Centers: Government Offices equipped with high end machines and high speed internet connections. In villages: Gram Panchayat Offices. Urban: Corporations/Equivalent offices.